Small businesses and large corporations alike stand to benefit from using aluminum in as much of their operations and products as they can. This extremely versatile and equitable metal is such an important component for a sustainable and profitable work force. Why is aluminum so important? For many reasons, including its strength-to-weight ratio and it’s highly reusable. Reusability, when compared to most materials, is on a completely different level, as approximately 75 percent of all aluminum produced is still being used today. The aluminum can is the symbol used to promote recycling throughout the world. Never throw your can in the trash, look for the blue bins to avoid looking like a lazy pig. When businesses make an effort to be “green” or environmentally friendly, statistics show that they receive favorable first-impressions from the public. Caring about the environment is more than just a trend, it’s a lifestyle, so when businesses fit a consumer’s lifestyle, they win the hearts and minds of their customers before they even commit to buy. When it comes to recycling, aluminum is the top material, both in volume and in profitability. Because it so prevalent in so many industries, aluminum creates over 155,000 jobs in manufacturing, along with additional employment created because of the added profits made that would not be possible with other materials. Part of the reason that recycling is so big in the aluminum industry is due to the simple fact that it costs less to repurpose used aluminum than it is to produce new aluminum. The biggest consumers of aluminum can get concrete numbers from increasing their percentage of recycled aluminum used, making it a very attractive way for investors to increase profits with no risk. Take a look at major companies like Apple, Google, or Facebook. Their offices, supplies, and products are all being made with more green technology than ever before. This decision to go with more recyclable materials isn’t made to appear considerate to the environment, not on this merit alone, it is directly responsible for increases in profitability and lower overhead costs. Apple now operates at over two-thirds recycled materials for their products, which are synonymous with extremely resilient and modern craftsmanship. Google and Facebook’s offices are the highest-rated for environmentally-friendly buildings. When you drop your can into a recycling bin, it takes only two months or less to reappear on store shelves. For most of the plastics and other metals that could be replaced with aluminum, their recyclability is not only lower, but also slower, with some materials taking years to reappear in a new product. The future is a bleak one, when it comes to the finite resources we have on Earth. It is in everyone’s best interest to recycle aluminum and use it wherever the opportunity presents itself. We can’t model success after competitors who use unsustainable materials or continue to kick the can down the street because it requires much less time and effort to stay complacent. State Metal Industries., a South Camden mainstay, manufactures high-quality specification secondary aluminum ingot. We’ve been providing superior customer service since 1948. For more than a half century State Metal Industries. has been an industry recognized supplier of standard and specification aluminum. 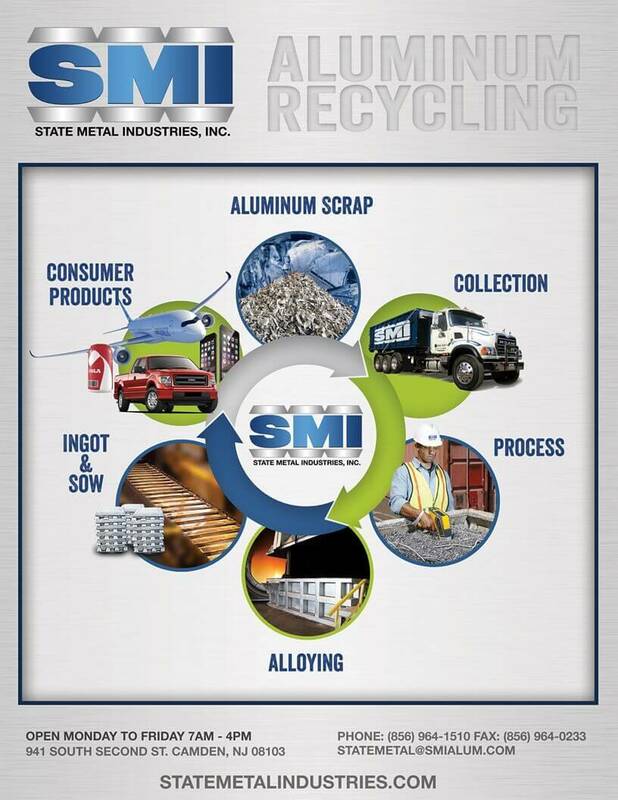 A busy secondary aluminum source melting millions of pounds of scrap per month, State Metal Industries has an unwavering commitment to meet individual customer’s unique needs. State Metal Industries processing, metallurgical and manufacturing expertise, and state-of-the-art technology have allowed us to develop long-term, successful business relationships with some of the best manufacturers in the U.S. and overseas. © 2019 State Metal Industries.